Ovarian Cancer Treatment May Be Found In Epigenetic Therapy | What is Epigenetics? Ovarian cancer is not the most common of cancers, but it is the leading cause of gynecological cancer related death for women in the U.S. It is often hard to detect; many women don’t display symptoms until it’s in an advanced stage, and then it may be too late for treatment as it can easily spread to the uterus, cervix, or fallopian tubes. Treatments typically include chemotherapy, radiation, hormone therapy, or clinical trials for up-and-coming medicines; however, the new field of epigenetics may provide some hope for future cancer elimination. In a recent study out of Johns Hopkins Kimmel Cancer Center, Dr. Cynthia Zahnow and her colleagues investigated a new way to attack ovarian cancer by utilizing a combination of two common therapies that alone aren’t very effective, but together could show incredible promise in tumor regression. Zahnow and her team employed a group of immunotherapy drugs called checkpoint inhibitors which block cancer’s defense proteins. Checkpoint inhibitors have previously been used in the fight against viruses and cancers, and have shown promise in treating renal cancers, melanoma, and non-small cell lung cancers, though not especially effective in treating ovarian cancer. They supplemented these checkpoint inhibitors with epigenetic therapies that treat types of cancer by turning suppressed genes back on via mechanisms and enzymes like DNA Methylation and histone acetyltransferases (HATs). These genes have been silenced by either a presence of added methyl groups, or the chromatin has been wound too tightly around the histones. Like the checkpoint inhibitors, this method of treatment has also not been especially effective in treatment of ovarian cancer. 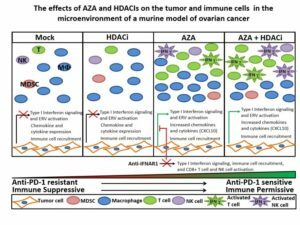 The effects of AZA and HDACIs on the tumor and immune cells in the microenvironment of a murine model of ovarian cancer. Source: Johns Hopkins Medicine. To begin the experiment, several mice were injected in the abdomen with a form of mouse ovarian cancer cells, which later developed into hundreds of small tumors. The presence of these tumors led to a condition called ascites, which is a buildup of fluid in the abdomen. The fluid contained both cancer and immune cells, allowing the team to keep a close eye on the immune response of the mouse as well as the tumor growth and activity. In a culture dish, the researchers had treated two sets of cancer cells with two different epigenetic therapy drugs: one with 5-azacytidine (AZA), a DNA methyltransferase inhibitor that removes methyl groups from DNA, and the other with histone deacetylase inhibitors (HDACi), an epigenetic enzyme that allows DNA to uncoil from histones. They then injected the mice with the pretreated cancer cells. The research team found that the mice injected with the AZA pretreated cells experienced a significant decrease in ascites, a significant increase in tumor-fighting immune cells, and an increase activity in immune response genes when compared to the mice injected with untreated cells. In the mice only injected with the HDACi cells, they found that the immune response and tumor activity were not affected. They then injected the mice with cancer cells treated with both AZA and HDACi, and found an even greater presence of immune cells in the ascites fluid, a decreased tumor load and greater survival rate than the mice treated with just AZA, indicating that the addition of HDACi influences the mouse’s immune system. Zahnow and her team experienced their greatest results when they supplemented an immune checkpoint inhibitor α-PD-1 with the pretreated AZA and HDACi cells, which yielded the longest survival rate and greatest decrease in ascites and tumor load. This discovery implies that the combination of treatments helps to revitalize and arm the animal’s immune system to combat the cancer, rather than having the drugs acting directly to kill the malignancies. 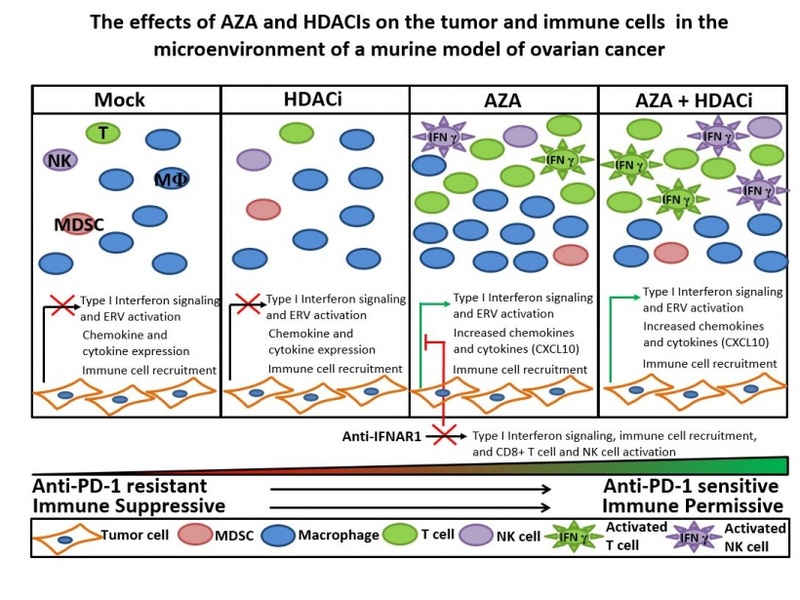 Though this study is in its infancy, combining AZA with a checkpoint inhibitor is currently being used clinical trials to treat women with ovarian cancer. Further research on the effects of adding HDACi is needed, but Zahnow hopes that her results can establish a treatment option that combines all three angles to effectively treat the cancer. Source: Zahnow, Cynthia A. et al. (2017). Epigenetic therapy activates type I interferon signaling in murine ovarian cancer to reduce immunosuppression and tumor burden. PNAS, 114(51): E10981-E10990 doi: 10.1073/pnas.1712514114. Reference: Johns Hopkins Medicine. “Combination strategy could hold promise for ovarian cancer.” Johns Hopkins: New and Publications, 5 Dec 2017.